The Case for Articular Cartilage Paste Grafting. In 1991, we developed the "Articular Cartilage Paste Grafting" technique to provide a simple and cost-effective method to treat acute and chronic osteocartilaginous lesions in both healthy and arthritic knees. The rationale behind the invention of this technique was that if marrow cells were released from the bone marrow below a defect and came in contact with signaling factors in the extracellular matrix of cartilage, then those pluripotential cells and the chondrocytes in cartilage could form healthy repair tissue if combined with bone and impacted into a morselized lesion with a matrix of bone. The lesion had to be morselized, or super microfractured, to stimulate a significant healing response. We learned that the paste only had to fill the holes and not fill-up the lesion as hypertrophy was noted in the follow-up evaluations. Seventy biopsies of the first 125 paste graftings were reviewed by an independent histopathologist, who noted that biopsies from one-third of the lesions had grown cartilage indistinguishable from normal, one-third appeared to be a mix of fibrocartilage and hyaline cartilage and one-third appeared to be solely fibrous tissue. “At 12 weeks, paste-grafted lesions were totally filled with smooth white cartilaginous tissue that was similar to surrounding tissue, while the microfractured lesions were filled with a yellow and white overlapping tissue that was thinner and more fragile than the surrounding cartilage. The DNA-normalized GAG content of the repair tissue showed a time-dependent increase with significant differences between groups at 8 and 12 weeks. Paste grafting appears to improve repair tissue by utilizing a greater quantity of pluripotential cells, cartilage matrix, and viable chondrocytes, creating a synergistic interaction between all three that results in greater production of collagen II and aggrecan. Study in rabbits (25 adult rabbits) with follow-up at 4, 8 and 12 weeks. Three groups were observed: (1) paste graft; (2) paste graft with a tissue covering; (3) untreated defects. this turnover slows with time; showing increasing stability of the formed repair tissue. The Stone Research Foundation has published our 2 - 12 year outcome data of arthritic patients undergoing combined paste grafting and meniscus transplantation with excellent survival of the implant and preservation of the improved clinical results and is completing our 10 - 20 year follow-ups on our original paste grafting group. We believe that paste grafting represents a cost-effective, one-step outpatient procedure that deserves consideration for acute and chronic cartilage lesions. And, we believe that arthritis can and should be successfully treated returning patients to active lifestyles rather than palliative treatment with drugs and activity modification. We hope you agree and we look forward to your input. 1. Jaroszewski J, Kruczynski J, Piontek T, Trzeciak T, Lubiatowski P. [The value of autologous osteochondral paste for in-vitro treatment of damage to articular cartilage. Part I. Macroscopic and microscopic assessment of the regenerated articular surface]. Chir Narzadow Ruchu Ortop Pol 2003;68-4:237-41. 2. Jaroszewski J, Kruczynski J, Piontek T, Trzeciak T, Kaszuba B, Lubiatowski P. [Value of autologous transplantation of osteo-chondral paste in reconstruction of experimental cartilage defects. Part II. Microscopic analysis of integration with surrounding cartilage, structural integrity and subchondral bone reconstruction in repair tissue]. Chir Narzadow Ruchu Ortop Pol 2003;68-5:335-40. 3. Jaroszewski J, Kruczynski J, Trzeciak T, Lubiatowski P, Kaszuba B. [Value of osteo-chondral paste autologous transplantation in experimental cartilage defects reconstruction. 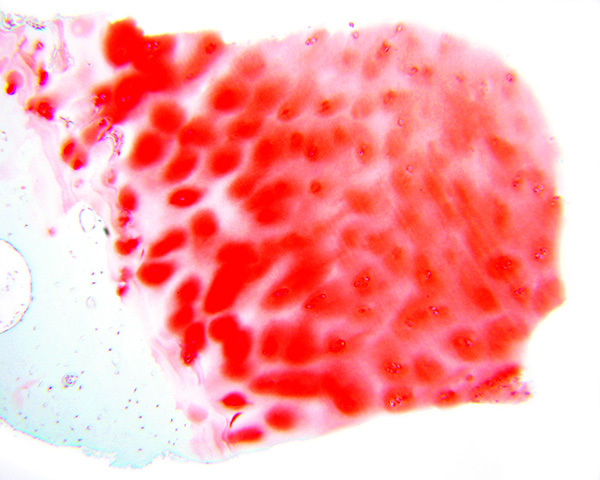 Part III--Microscopic analysis of reconstructed cartilage thickness and surface regularity]. Chir Narzadow Ruchu Ortop Pol 2004;69-1:35-9. 4. Jaroszewski J, Kruczynski J, Trzeciak T, Piontek T, Kaszuba B. [Value of osteo-chondral paste autologous transplantation in experimental cartilage defects reconstruction. Part IV--Microscopic analysis of cellularity and of traits of necrosis in the defect-filling tissue].Chir Narzadow Ruchu Ortop Pol 2004;69-2:115-9. 5. Kon E, Vannini F, Buda R, Filardo G, Cavallo M, Ruffilli A, Nanni M, Di Martino A, Marcacci M, Giannini S. How to treat osteochondritis dissecans of the knee: surgical techniques and new trends: AAOS exhibit selection. J Bone Joint Surg Am 2012;94-1:e1(-8). 6. Xing L, Jiang Y, Gui J, Lu Y, Gao F, Xu Y. Microfracture combined with osteochondral paste implantation was more effective than microfracture alone for full-thickness cartilage repair. Knee Surg Sports Traumatol Arthrosc 2013;21-8:1770-6.